Hi, just recently took a liking for XFCE and i've been trying to make stuff look nice, but i've run into an aesthetic problem. As you can see the panel is brighter under the datetime and battery monitor plugins, i have tested with other themes and this still appears. Rebooting/logging out does not fix it. Any help is appreciated. If they are gtk2, can you post back the contents of ~/.gtkrc-2.0? Xfce 4.12 on fedora 27 workstation. Strangely enough they work fine on my thinkpad, which is running the same stuff..
Update: Just moved to Xfce on my desktop (also running fedora) and I'm having the same issue there. No, there's no change on the panel. ...play around with the last value in oth those lines (from 0.0 to 1.0 to see if you can get the transparency correct. You can also try changing the first 3 values (rgb values) to try to match the colour. And finally, what is the current appearance theme that you are using? Setting the opacity in css doesn't work, however setting the color works fine. I have to specify hover colors as well though. 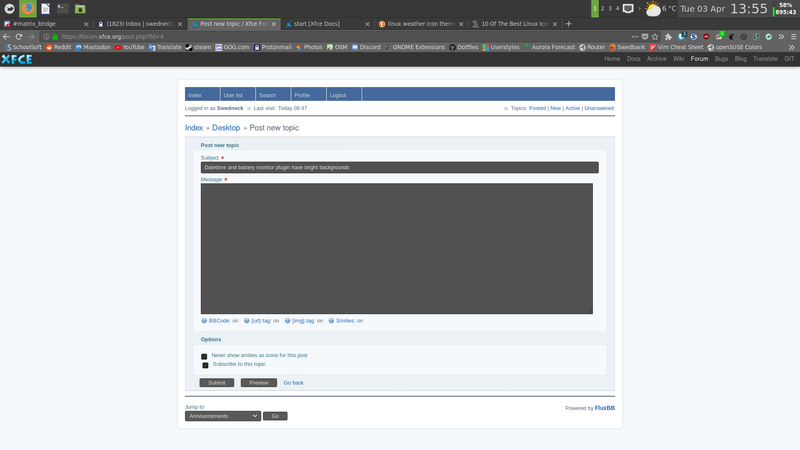 I'm using geeko-dark, but as i said this affects every theme i have (except arc for some reason). (except arc for some reason). If it works on Arc, then make sure that the themes you are using support the version of GTK that is installed on your system (many don't). The Greybird theme is kept up to date. Can you try it? You can get the latest version here: https://github.com/shimmerproject/Greybird if the one in your repositories is dated. The latest version of Greybird (from github) has the same issue. I just installed geeko-dark on my arch system and it works fine. Can you create a second account on your computer and try with a clean profile? Lets see if this is a system issue or a profile issue. Edit: My geeko-dark panel looks different from yours. Where did you get your version of that theme from? I got my copy from https://github.com/LelCP/geeko-gtk-theme. The issue is still there on a fresh user account. I edited my previous post. Where did you get this theme? Is it included in the fedora repositories or did you download it. If downloaded, make sure you have the latest version (see link above). I got Geeko from github, it's the latest version. Hmmm. I'm downloading the fedora 27 xfce iso now. I'll give it a try. Can I see your panel configuration so I can replicate it? Okay, got it. It's a theme issue. It's odd that I can't replicate this issue on my arch install though. Now that's service. My mother cannot get her mailman to consistently close the flap on her mailbox, even when it is pouring rain - and he's getting paid. The developers of Xfce should use your avatar for the next release version of their DE, in recognition for all you do for their flock, lol. Complete with a t-shirt that has "ToZ" on it. I'll use this fix until i can pester LCP to fix the theme, thanks!